View More In Tarps - Page 3. 【The Anna tarpaulin】is a great multi-purpose tarp that can be used around the house and/or work place. 【GUARANTEE】: Buy this item with confidence. If there any issue with it, don't hesitate to contact us, and we will response and solve it within 24 hours. Your satisfaction is our top priority. 【Tips】: After receiving the product, there may be an odor, which can be ventilated and emit odors. 【Size Description】: Product size is similar, there are 1-3cm error, subject to the actual size. Be careful to shoot! 【Photo Caption】: Product is in-kind shooting, because due to light, angle, different display and other causes of color, please understand! 【KINDLY NOTE】: Delivery time: 10-15 working days. Return line 30 days. Direct sales by manufacturers. 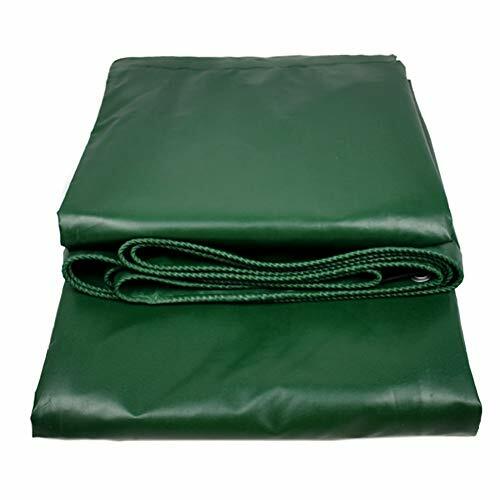 ★The Waterproof Tarp made from a tight PVC weave which provides super durability and flexible solution to all of your covering needs. ★Breathable, Water/ Milder Resistant Canvas, Shrink proof, Waterproof, Rot, Rust and Mildew resistan. ★This is a great multi-purpose tarp that can be used around the house and/or work place. ★These tarp can be used indoors too! Protect products in your store from dust, or cover your floors when painting or cleaning.The uses are endless!